NGINX Plus can operate as a proxy cache server, sitting between the origin server and remote clients. NGINX Plus manages the traffic to the origin server and caches (stores) common, unchanging resources. This allows NGINX Plus to respond directly to clients when these resources are requested and thus reduces the load on the origin server. NGINX Plus’ proxy cache is most commonly deployed in a data center next to the origin server, and may also be deployed in a CDN‑like fashion in globally distributed PoPs. Why Doesn’t NGINX Plus Use a Shared Disk for Caching? Each NGINX Plus server acts as an independent web cache server. There is no technical means to share a disk‑based cache between multiple NGINX Plus servers; this is a deliberate design decision. Storing a cache on a high‑latency, potentially unreliable shared filesystem is not a good design choice. NGINX Plus is sensitive to disk latency, and even though the thread pools capability offloads read() and write() operations from the main thread, when the filesystem is slow and cache I/O is high then NGINX Plus may become overwhelmed by large volumes of threads. Maintaining a consistent, shared cache across NGINX Plus instances would also require cluster‑wide locks to synchronize overlapping cache operations such as fills, reads, and deletes. Finally, shared filesystems introduce a source of unreliability and unpredictable performance to caching, where reliability and consistent performance is paramount. Why Share a Cache Across Multiple NGINX Plus Servers? If your primary goal is to create a very high‑capacity cache, shard (partition) your cache across multiple servers. We’ll cover this technique in this post. If your primary goal is to achieve high availability while minimizing load on the origin servers, use a highly available shared cache. For this technique, see the companion post (coming soon). Sharding a cache is the process of distributing cache entries across multiple web cache servers. 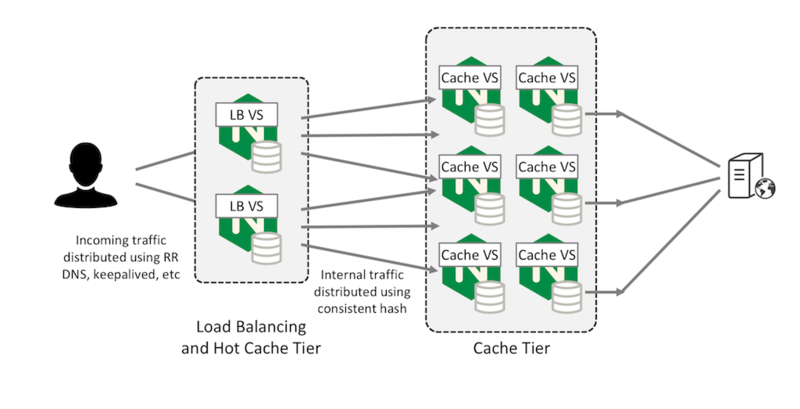 NGINX Plus cache sharding uses a consistent hashing algorithm to select the one cache server for each cache entry. The figures show what happens to a cache sharded across three servers (left figure) when either one server goes down (middle figure) or another server is added (right figure). The total cache capacity is the sum of the cache capacity of each server. You minimize trips to the origin server because only one server attempts to cache each resource (you don’t have multiple independent copies of the same resource). This pattern is fault tolerant in the sense that if you have N cache servers and one fails, you lose only 1/N of your cache. This ‘lost portion’ is evenly distributed by the consistent hash across the remaining N –1 servers. Simpler hashing methods instead redistribute the entire cache across the remaining servers and you lose almost all of your cache during the redistribution. 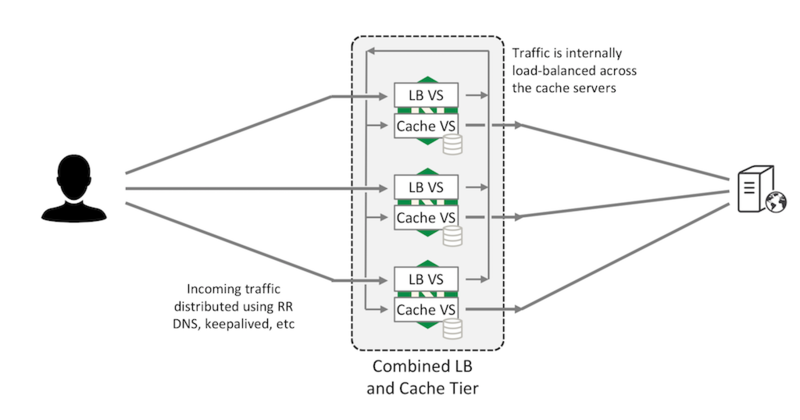 You can distribute incoming traffic across the Load Balancer (LB) tier using the active‑passive high availability solution in NGINX Plus, round‑robin DNS, or a high‑availability solution such as keepalived. You can choose either of two optimizations to your cache‑sharding configuration. You can combine the LB and Cache tiers. In this configuration, two virtual servers run on each NGINX Plus instance. 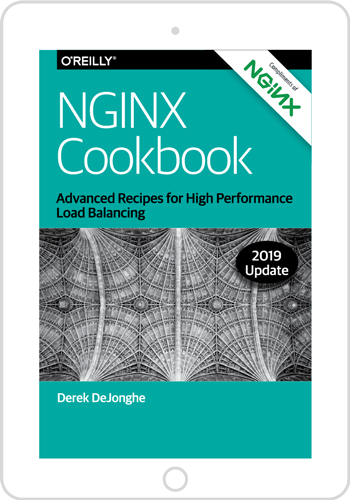 The load‑balancing virtual server (“LB VS” in the figure) accepts requests from external clients and uses a consistent hash to distribute them across all NGINX Plus instances in the cluster, which are connected by an internal network. The caching virtual server (“Cache VS”) on each NGINX Plus instance listens on its internal IP address for its share of requests, forwarding them to the origin server and caching the responses. This allows all NGINX Plus instances to act as caching servers, maximizing your cache capacity. Alternatively, you can configure a first‑level cache on the frontend LB tier for very hot content, using the large shared cache as a second‑level cache. This can improve performance and reduce the impact on the origin server if a second‑level cache tier fails, because content only needs to be refreshed as the first‑tier cache content gradually expires. If your cache cluster is handling a very large volume of hot content, you may find that the rate of churn on the smaller first‑level cache is very high. In other words, the demand for the limited space in the cache is so high that content is evicted from the cache (to make room for more recently requested content) before it can be used to satisfy even one subsequent request. In this case, you can fine‑tune your cache to store just the most commonly requested content. The proxy_cache_min_uses directive can help to identify this content. Sharding a cache across multiple NGINX or NGINX Plus web cache servers is an effective way to create a very high‑capacity, scalable cache. The consistent hash provides a good degree of high availability, ensuring that if a cache fails, only its share of the cached content is invalidated. The second part of this post describes an alternative shared cache pattern that replicates the cache on a pair of NGINX or NGINX Plus cache servers. Total capacity is limited to the capacity of an individual server, but the configuration is fully fault‑tolerant and no cached content is lost if a cache server becomes unavailable. Try out cache sharding on your own servers – start your free 30‑day trial today or contact us for a demo.